Thank you for your interest in our work. 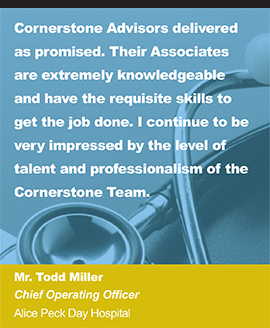 At Cornerstone Advisors, we take great pride in our efforts, and more importantly our results. We approach every client engagement with a concentrated focus on the outcome: Measureable Results. To us, success is realized, not when the task is complete, but rather when the business or clinical objectives have been met. 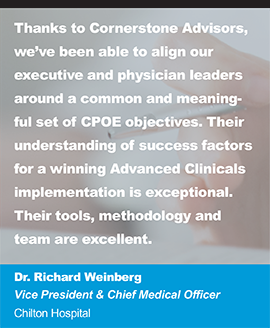 Whether the objective is to enhance physician adoption, improve clinical quality, boost throughput, increase operational efficiencies, or reduced costs – the desired results become the purpose of our work. 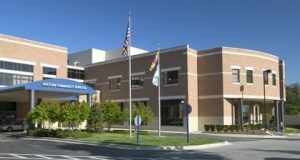 Below are a few sample case studies of our work. Please feel free to review and download. 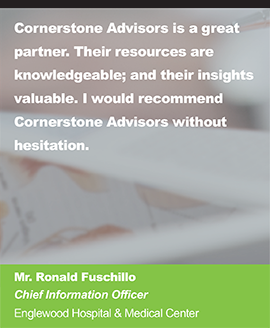 We welcome the opportunity to have you speak with our clients in order to better understand the value of our involvement and the quality of our results. 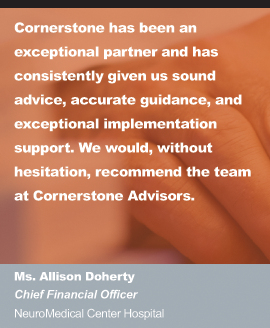 The following provides an overview of Cornerstone Advisors – Epic Revenue Cycle Implementation, Conversion, and Optimization results. 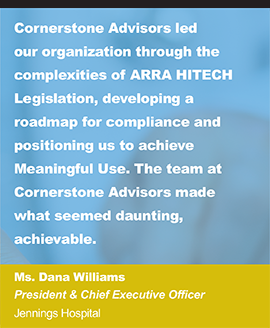 This enterprise-wide Epic Implementation concluded with outstanding results (Top Performer Results as measured by Epic) in July 2013. 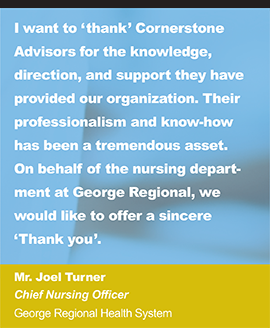 The following provides an overview of Cornerstone Advisors – Meaningful Use Assessment, Planning, and Implementation work which enabled George Regional Health System to attest for Stage I compliance in May 2012. 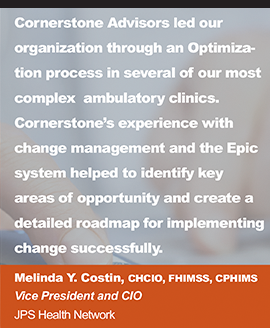 The following provides an overview of Cornerstone Advisors – Epic Planning and Implementation work which has enabled Washington Hospital & Health System to rollout Epic throughout the entire Inpatient & Ambulatory enterprise. 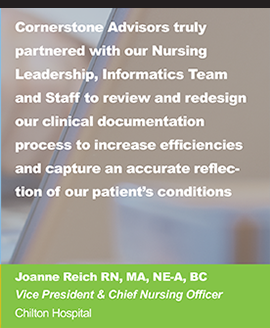 The following provides an overview of Cornerstone Advisors – clinical documentation optimization work which enabled Chilton Hospital to improve nurse utilization and reduce documentation times by as much as 50%. 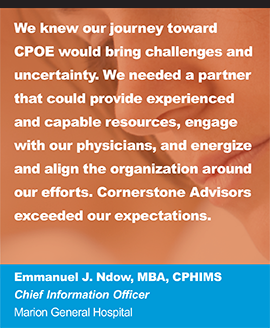 The following provides an overview of Cornerstone Advisors – CPOE Implementation & Physician Adoption work which enabled Chilton Hospital to achieve nearly universal adoption of their Computerized Physician Order Entry solution. 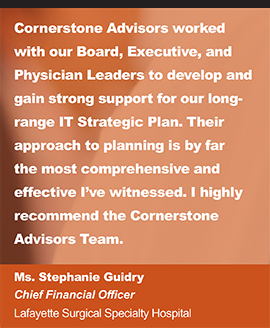 The following provides an overview of Cornerstone Advisors – MEDITECH 6.0 Planning and Implementation work which has enabled The NeuroMedical Center Hospital to plan, select, and implement MEDITECH 6.0 in record time. This month’s “MEDITECH Expanse Field Notes” webinar, featuring guest speaker Doug Kanis, DO, Internal Medicine at Pella Regional Health Center, will provide an overview of physician documents. On January 1, Kalispell Regional Medical Center (Kalispell, Montana) went live with the MEDITECH 6.1 Electronic Health Record.